America’s favorite holiday tradition returns once more to dazzle and enchant millions nationwide with its signature magic. 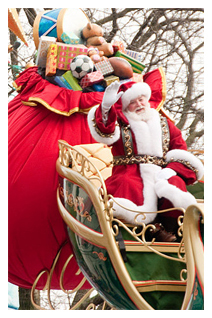 On Thursday, Nov. 24, 2011 at 9 a.m., the 85th Anniversary Macy’s Thanksgiving Day Parade® will take to the streets of New York City with a cornucopia of whimsical treats for the whole family. From new giant character helium balloons, including Paul Frank’s iconic monkey Julius and Sonic the Hedgehog, to out-of–this world floats including ZHU-NIVERSE! and Frozen Fall Fun, the magic begins at the sound of Let’s Have A Parade! This iconic phrase has catapulted gaggles of clowns, exciting performance groups, pulse-pounding marching bands, celebrities and the one-and-only Santa Claus down the streets of Manhattan for 85 years of unrivaled wonder. In 1924, a foundation was set for an incomparable procession that has grown into a world-famous icon. Giving thanks while giving back to New York and the nation, Macy’s Thanksgiving Day Parade has become the benchmark for pageantry and the official kick-off celebration to the holiday season. Before the event kicks-off, the ribbon must be cut and the iconic words “Let’s Have a Parade” must be shouted, as has been the tradition since 1924. Joining parade Executive Producer Amy Kule for this very special moment are kids from Tuesday’s Children, a family service organization that has made a long-term commitment to every individual impacted by the events of September 11. This ribbon-cutting is meant to signify both a moment of remembrance and serve as an uplifting tribute to the lives lost on that day 10 years ago. Ready for it 85th anniversary edition, the parade of wonder will feature 15 giant character balloons; 44 novelty/ornament balloons, balloonicles and balloonheads; 27 floats; 1,600 cheerleaders, dancers and performance group members; 800 clowns; 11 marching bands; a host of celebrity performers, and the one-and-only Santa Claus. Also joining the balloon procession is a special creation by world-renowned filmmaker and artist Tim Burton. B., a lonely balloon boy outsider with a special wish to fly in the Macy’s parade, will debut as the line-up’s latest acquisition for its “Blue Sky Gallery” series. The airborne gallery features inflatable versions of artistic works by world-renowned modern artists. Previous marches have featured balloons by Tom Otterness, Jeff Koons, Keith Haring and Takashi Murakami. Rounding out the new balloon cast will be the extremely outspoken and affable Aflac Duck balloonicle, a recreation of the 1948 Harold the Policeman balloon, and the winning design of Macy’s nationwide Great American Elf Adventure which invited the public to design a new Elf balloon for the parade - Keith Lapinig’s Gazer. Returning buoyant balloon favorites will include Buzz Lightyear, Clumsy Smurf, Diary of A Wimpy Kid, “Super Cute” Hello Kitty, Kermit the Frog, Kung Fu Panda™, Pikachu, Pillsbury Doughboy®, Ronald McDonald®, Sailor Mickey, Snoopy the Flying Ace, Spider-Man® and SpongeBob SquarePants. The parade’s wonder-filled floating stages depict the familiar and the out-of-this world. From a hometown hockey game with a twist to a wonderland of fun, the five new floats set to join the parading fun will have audiences mesmerized, leaving behind a trail of enchantment. Completing the convoy of 27 floats the magic on board for the ride include scenes depicting a Turkey Day slap shot showdown on the Frozen Fall Fun float, the celebration of the nation’s beacon of hope and liberty on the Gift of Freedom, the special nod to Macy’s parade history on the Hats Off To Our Heritage float, the frolicking celebration aboard P.B. Polar Bear, and the zhany fun found on the ZHU-NIVERSE! The returning float roster includes 1-2-3 Sesame Street, Big Apple, Bridge To The Future, Christmas in Central Park, Dora’s Christmas Carol Adventure, Elves Raise the Roof, Home Baked Goodness, International Cele-bear-ation Clock Tower, Jolly Polly Pirate Ship, Local Heroes Helping Everyday, Macy’s Parade Drum, Marion-Carole Showboat, Mount Rushmore’s American Pride, On the Roll Again, Pep Rally, Santa’s Sleigh, The Smurfs?, Snoopy’s Doghouse, Tom Turkey, The True Spirit of Thanksgiving, Wild West Express and Woodland Family Gathering. Set to get the party started and bring the beat to the holiday spectacular, America’s best marching bands will hit all the right notes as they step into the spotlight. After more than a year’s worth of preparation, the 11 marching bands set to wow the crowds with their musical and marching ability are ready for the start of the holiday season. Representing their home state and local community, the bands in the line-up are truly the best of the best. Stepping-off to kick start the holidays will be Carmel High School, Carmel, IN; Dobyns-Bennett High School, Kingsport, TN; Na Koa Ali’l: Hawaii All-State Marching Band, Hawaii; Homestead High School, Cupertino, CA; Homewood High School, Homewood, AL; Legacy High School, Broomfield, CO; Miami University; Oxford, OH; Nation Ford High School, Fort Mill, SC; NYPD Marching Band, New York, NY; Plymouth-Canton Educational Park, Canton, MI; and Macy’s Great American Marching Band, featuring students from all 50 states. The parade’s most ardent purveyors of razzle dazzle are the nation’s most entertaining performance groups. They add a dose of dance, pomp, cheer and vocal acrobatics that set the stage for a celebration. From cheerleaders to a Bolivian dance ensemble, this year’s parade features a host of unique performers. Set to wow the crowds are performers 610 Stompers, Alma Boliviana, Camp Broadway, CAP 21, Mobile Azalea Trail Maids, Spirit of America Dance, Stagedoor Manor, United We Sing and Varsity Spirit Cheer. Taking the stage to help spread holiday cheer will be stars from music, film, stage, sports and television, who are set to perform for the nation at Macy’s famed red star mark on 34th Street. Stars joining the festivities this year include Rodney Atkins, the Big Apple Circus, Mary J. Blige, Cobra Starship, Michael Feinstein, The Fresh Beat Band, Cee Lo Green, Avril Lavigne, Shelby Lynne, Mannheim Steamroller, China Anne McClain, Scotty McCreery, Ingrid Michaelson, the cast and Muppets of Sesame Street, Savannah Outen, Power Rangers Samurai, Miss America 2011 Teresa Scanlan, Willard Scott, Straight No Chaser, U.S. Naval Academy Glee Club, Johnny Weir and Zendaya. Since its first national broadcast in 1948, Macy’s Thanksgiving Day Parade has been the nation’s star attraction. Regularly one of the country’s most viewed events, millions of families tune-in from coast-to-coast to watch the telecast. This year, the TODAY Show’s Matt Lauer, Ann Curry and Al Roker will treat viewers from 9 a.m. to Noon, in all time zones in the United States, to Thanksgiving’s best entertainment special. On board to add an extra dose of star power are exclusive performances from some of the hottest Broadway shows including Daniel Radcliffe and the cast of How to Succeed in Business Without Really Trying, Sister Act, and Spider-Man: Turn Off The Dark. In addition, the telecast will feature a special performance from the world-famous Radio City Rockettes?. The 85th Macy’s Thanksgiving Parade will step-off this year at 77th Street and Central Park West. The procession will travel down to Columbus Circle, turn onto Central Park South before making a right turn to march down 7th Avenue to 42nd Street. The Parade will then turn east towards 6th Avenue where it will march down the Avenue of the Americas. At 34th Street, the parade will make its final turn west marching in front of Macy’s Herald Square. The Parade will begin promptly at 9 a.m. and end at Noon. A Holiday Treat for Children Everywhere, the motto of the Macy’s Parade has stood for 85 years, and will continue to usher in the season of joy for years to come. More information on the Macy’s Thanksgiving Day Parade is available to the general public at www.macys.com/parade or via the Parade Hotline at (212) 494-4495. PLEASE NOTE ALL TALENT, PERFORMANCES, LINE-UP AND INFORMATION INCLUDED ARE SUBJECT TO CHANGE. This Sunday, November 6th, 2011, marks the 41st year of the ING NYC Marathon. Around the world, the word "marathon" evokes images of New York City. Before the New York race began, marathons were modest events run by a few athletes and followed by a few fans interested in the limits of human endurance. New York Road Runners and marathon co-founder Fred Lebow changed that. Today many marathons are huge media events that take over entire cities around the globe. None is as prominent as the ING New York City Marathon, but all city marathons are modeled on it. Modern marathoning owes its start -- and its world-class status -- to New York. The first New York City Marathon, though, was a humble affair. In 1970, 127 runners paid the $1 entry fee to NYRR to participate in a 26.2-mile race that looped several times within Central Park. Fifty-five runners crossed the finish line.When Lebow redrew the course through all five New York boroughs six years later, not everyone could appreciate his vision. But 2,090 runners lined up at the start for the chance to run from Staten Island through Brooklyn, Queens, and the Bronx to Manhattan. The expanded course attracted two-time Olympic marathon medalist Frank Shorter, along with reporters and television cameras. Thousands of spectators lined the streets and cheered the runners. By reconfiguring the course, Lebow had drawn the city together and attracted recognition around the world. The New York City Marathon's unique mix of athletics, neighborhood spirit, and international media attention soon attracted the world's best runners to the annual fall race. By the late 1970s, the running boom was exploding and New York was at the center. More than 9,000 people participated in 1978 when Norwegian Grete Waitz set a women's marathon world record, finishing in 2:32:30. Several men's and women's records fell in the early years, but the New York race was soon about more than speed. When international sanctions against South African athletes were lifted in 1992, Willie Mtolo chose to run New York. He bested the field and garnered media coverage around the world. When Tegla Loroupe broke the tape at the Central Park finish in 1994, her win proved that African women were on par with the African men in their ability to run the 26.2-mile distance. She did it in New York, and the world took notice. Soon Kenyan women were invited to other major distance races. While the marathon has always been a focus of community spirit, with more than two million New Yorkers lining the streets to support the runners, that aspect of the race was most apparent in November 2001. Less than two months after the September 11 terrorist attacks, the New York City Marathon became a race of hope and renewal for participants, spectators, and all New Yorkers, and patriotism ran high as the marathon hosted the men's and women's USA Marathon Championships. Forty years after its start, the ING New York City Marathon continues to grow in size and to be the leader among marathons around the world.